Designed by Tommy Hart, one of Case's master cutlers, the Russlock 1953L was first available in 2000 and is one of the popular Many Case designs are currently being considered for the Case "Vault." Beginning in 2008, the Vault program retires selected knife patterns for a period of three years to increase their popularity as collectibles. Although any of Case's best knives are collector's items, the possibility of withdrawal from the market does increase their chances to gain value. The Russlock may have a better chance than most. The Russlock series is stamped with a number honoring the company founder, Jack Russell Case, who died in 1953; and the Russlock was one of Tommy Hart's last design efforts before Hart died in 1999. The Case Russlock features a unique rotating tang for efficient one-handed opening, plus a strong liner lock, and was considered high-tech at the time it was first issued. Pressing the tang lever against the side of the leg -- or any handy object such as a fence post -- swings the blade open, making the knife a real one-handed opener even if you're wearing gloves on a freezing cold day. The single California clip blade of high carbon stainless steel covers most chores well enough and gives the knife an especially sleek look. This version features jigged amber bone handle slabs and nickel silver bolsters with an engraved shield inlaid in one side. This large knife makes short work of pockets, since the tang protrudes when the knife is closed. A sheath is not provided at purchase, but Case does make a Cordovan leather belt sheath which fits any of the company's large folders, including the Amber Bone Russlock. 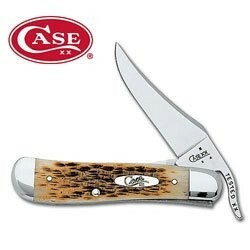 See the Case Mother-of-Pearl Slimlock for a gentleman's folder with thumb stud one-handed opening.